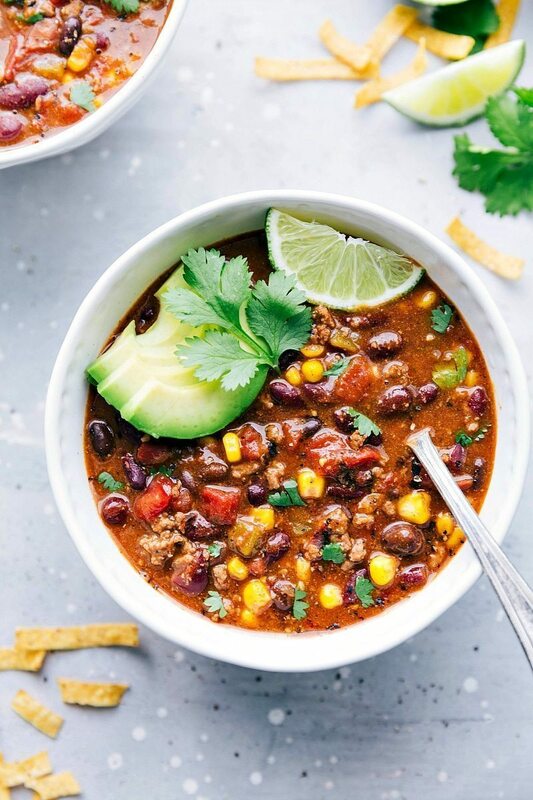 The best ever taco chili made in 30 minutes or less in the instant pot (pressure cooker)! Plus instructions for cooking this soup in a crockpot or on the stovetop. A few months ago, I finally caved and purchased an instant pot. I was maybe a little bit skeptical of how much I’d love it, but am happy to report I was 100% wrong and I, like so many others, am totally obsessed with it. (Here’s the exact one I have in case you’re in the market for one.) 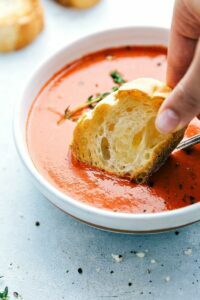 I’ve tried a few of my crockpot soup recipes in the instant pot and I’m loving having dinner ready so quick. Especially on those days when I forget to prep something earlier (or forget to throw the ingredients in my crockpot 6-8 hours before dinner time). I’m slowly updating recipes I’ve tried in the instant pot to give you directions for those, and, in the meantime, I’ve got a slew of other recipes ready to share that have been tested in the instant pot AND crockpot. If you’re new to my site, let me warn you right now, soups/chilis are pretty much my favorite meal on earth. So… there will be a lot coming this Fall/Winter/Spring. 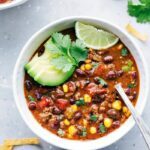 Can I make this taco chili if I don’t have an instant pot? YES! 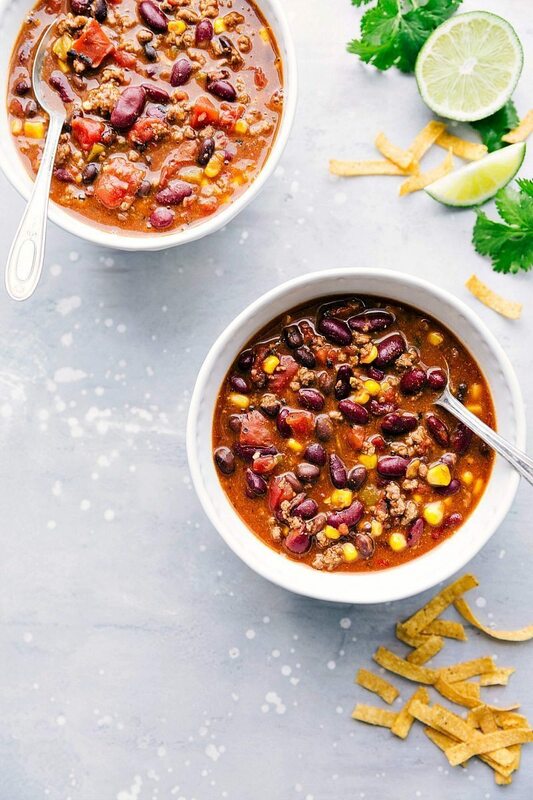 But before you totally dismiss this recipe because you don’t have an instant pot, let me tell you that you can make this taco chili without one! And below I’ve included the instructions for the different methods so you can see just how easy this chili is to make in whatever appliance/pot you choose to use. Stovetop: To make this taco chili on the stovetop: brown the ground beef and onion in a skillet over medium heat. Drain off any grease. 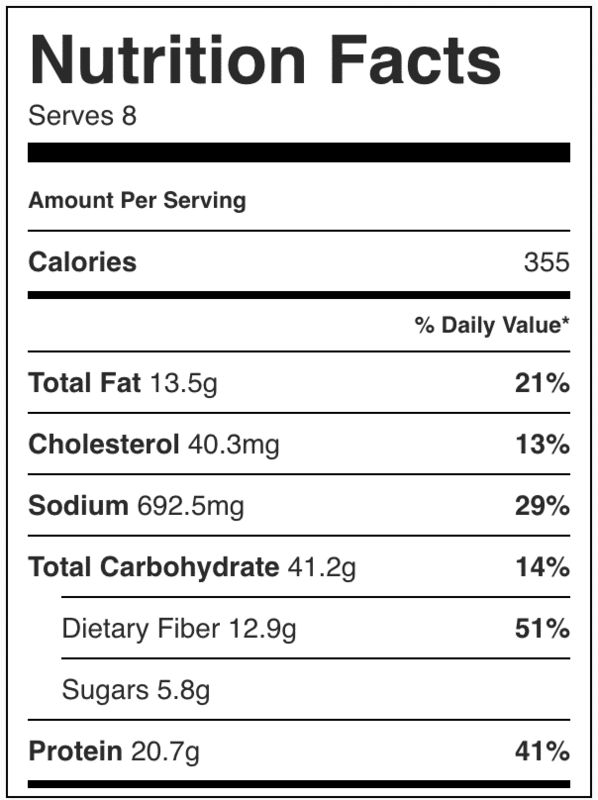 Add in all of the other ingredients. Stir and allow to simmer, stirring occasionally, over low heat for 30 minutes. Crockpot: To make this taco chili in the slow cooker, brown the ground beef and onion in a skillet over medium heat. Drain off any grease and place the meat mixture in the crockpot. Add all the other ingredients. Stir it all together and cover. Cook on high for 3-4 hours or on low for 6-8 hours. Instant Pot: To make this taco chili in the instant pot, you can actually saute the beef and onion first using the “saute” function. Once it’s browned through, you add all of the other ingredients and then cook it for 10 minutes. You’ll let out the pressure naturally for five minutes and then release it all and the soup is ready. Nothing beats a 15 minute cook time! Using the instant pot, this soup can absolutely be ready in 30 minutes or less. I hope you love this taco chili as much as my family has! 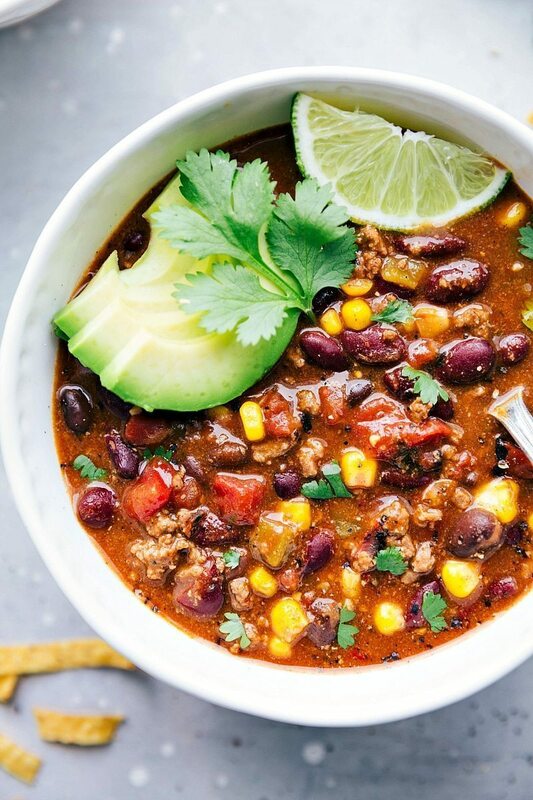 The best ever taco chili made in 30 minutes or less in the instant pot! 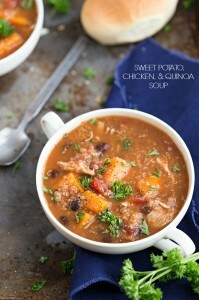 Plus instructions for cooking this soup in a crockpot or on the stovetop. Give everything a really good stir and then place on the lid. Select soup and change to 10 minutes. Allow to cook for 10 minutes and then let the pressure release naturally for 5 minutes. Then release any remaining pressure. Give it another good stir and taste for additional salt/pepper. When it's finished top individual bowls with a generous handful of cheddar cheese, a big scoop of sour cream and mix that in. Add fresh lime, fresh cilantro or green onions, and/or avocado to individual bowls as desired. 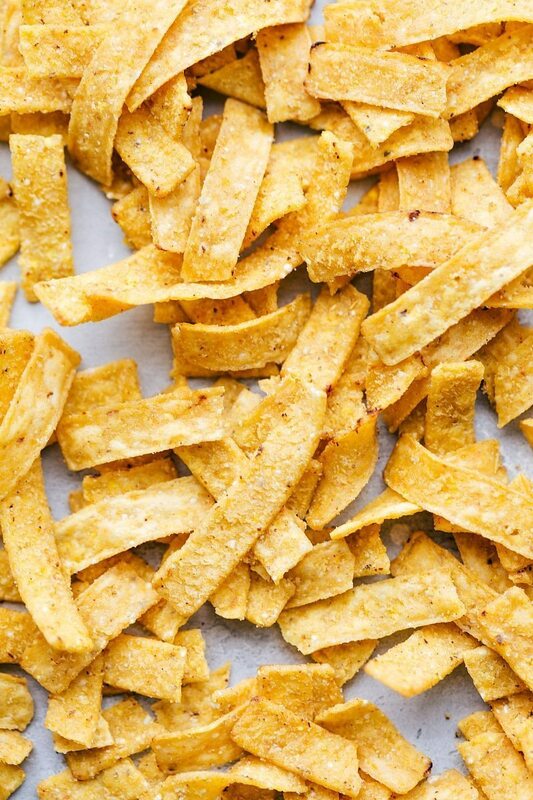 Add a handful of tortilla strips if desired. CROCKPOT: Cook the ground beef and onion in a skillet over medium heat until browned. Drain off any grease and place in the crockpot. Add all the other ingredients. Stir it all together and cover. Cook on high for 3-4 hours or on low for 6-8 hours. STOVETOP: Cook the ground beef and onion in a skillet over medium heat until browned. Drain off any grease. Add in all of the other ingredients. Stir and allow to simmer over low heat for 30 minutes. The instant pot link above is an affiliate link meaning if you were to purchase through that link I would receive a small commission at no extra cost to you. Thank you for supporting Chelsea’s Messy Apron! We finally had another cold/wet snap! This taco soup would be lovely! Taco soup is one of my favorite soups! I can’t decide if it’s because of all the different flavors or because it’s so hearty and filling, unlike some other soups. This recipe looks great, I’ll definitely have to break the crockpot out for this one since it just started getting cold here. This chili was delicious. Whole family loved it. I was a bit worried about the amount of ranch powder but it was perfect. So flavorful. Thank you for the recipe. Will be making it often. So happy to hear that! I’m glad it was a hit and will be made often 🙂 Thanks for the comment Michelle! Plan on making this for Wednesday and your Sausage and veggies dish tomorrow. Very simple recipes that look great and I’m sure taste just as great. Super delicious chili. Whole family loved it. Super easy to make. Thanks for the recipe. Yum!!!! Love hearing that! Thanks for the comment Michelle! This chili is cooking in my crockpot as I type this. The flavor profile is amazing. Taking this dish to a work Christmas party tomorrow. I just know my co-workers will love it. Thanks! Thanks so much Tracy! I hope everyone loves it 🙂 Happy Holidays! So bummed, I forgot the ranch seasoning mix. I hope it still tastes good!!! Hi Katie! 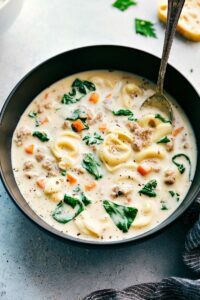 I’ve actually made this several times (3-4 times) in my instant pot and never had an issue; so I’d love to troubleshoot with you. Did you select soup and then change it to 10 minutes? This is DELICIOUS! My new fav chili. I’m rating it 5 stars despite having the same problem as the other commenter. My instapot also said BURN and I made this following directions to a T. Apparently after sautéing anything in the instapot you are suppose to take the meat out and “deglaze the pot” otherwise you are more likely to set off the BURN indicator. When mine went off I opened it and luckily nothing was burned to the pot that I could feel so I just stirred it and put it back to “soup”. Unfortunately, it only cooked for another 2 minutes before the indicator came back on. Luckily it was cooked through so we were able to enjoy this delicious recipe regardless. I’m having the same problem as well. It has burned twice on me in my new 6-quart instant pot. I think you might need to add water because the newer model instant pots are more susceptible to burning from what I’ve read. When I select soup, do I choose low or high pressure?